Latin dance is mainly derived from three styles: Native Latin, European, and African influences. The roots of Latin dance is deep and geographically embedded because it dates back to the fifteenth century when indigenous dances were first recorded by Europeans. Its influence was first derived from their native roots, the Aztecs and Incas. When sixteenth century seagoing explorers returned home to Portugal and Spain, they brought along tales of the native peoples. According to Rachel Hanson, no one knows how long these dance traditions were established, but they were already being developed and ritualized when they were observed by the Europeans. This suggests that these Native influences became the foundation for Latin dancing. Indigenous dance often told stories of everyday activities such as hunting, agriculture, or astronomy. When European settlers and conquistadors began to colonize South America in the early sixteenth century, they reinvented the local dance traditions, but still kept the styles of the natives. Catholic settlers merged the native culture with their own and incorporated catholic saints and stories to the dance. The Europeans were captivated by the highly structured, large member dance working together in a precise manner. It was not until the integration of European styles that modern Latin dancing became its true form. After the Europeans brought home the Aztec/Inca influences in the sixteenth century, they incorporated their own styles to the dance. Since the Aztec/Inca dances were performed in a group, many of the European dances were performed by a male and female. This was a new practice because European dances prohibited male and female dance partners from touching each other. The benefits of such dance style allowed musical appreciation and social integration, which became the form of Latin dance. However, “much of the storytelling element disappeared from the genre as the focus moved toward the rhythm and steps,” Hanson explains. The movement evolved differently because it brought a certain element of daintiness to the Aztec dances since the steps were smaller and the movements were less forceful. Combining African styles along with the Native and European influences is what truly makes Latin dance unique. The movement and rhythms of African influences left a permanent mark in Latin dance. When the African slaves entered Europe in the 1500s, they brought styles such as basic, simple movements (putting emphasis on the upper body, torso, or feet) and intricate movements like the coordination of different body parts and complex actions such as “fast rotation, ripples of the body, and contraction and release, as well as variations in dynamics, levels, and use of space.” The difference between the African and European styles was that it included bent knees and a downward focus (grounded to the earth) rather than a straight-backed upward focus like the Europeans, and whole-foot steps than toes and heels. Such influences of African roots allowed the beauty and uniqueness of Latin dance. Ballroom dance may refer, at its widest definition, to almost any type of partner dancing as recreation. 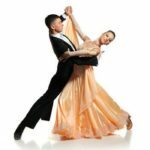 However, with the emergence of dancesport in modern times, the term has become narrower in scope, and traditionally refers to the five International Standard and five International Latin style dances (see dance categories below). The two styles, while differing in technique, rhythm and costumes, exemplify core elements of ballroom dancing such as control and cohesiveness. Developed in England, the two styles are now regulated by the World Dance Council (WDC) and the world dancesport federation. (Wdsf). In the United States, two additional variations are popular: American Smooth and American Rhythm, which combine elements of both traditional Latin and Ballroom dances. There are also a number of historical dances, and local or national dances, which may be danced in ballrooms or salons. Sequence dancing, in pairs or other formations, is still a popular style of ballroom dance. Private dance classes are the most effective way to take your dancing to the next level, learn a new dance style/genre or begin dancing for the first time. We ensure you get the right knowledge to suit your dance goals and receive the best in individual attention in technique, movement, steps and performance. We provide highly experienced and professional dance knowledge and i am available for private dance lessons 7 days a week. Salsa is a popular form of social dance that originated in New York City with strong influences from Latin America, particularly Puerto Rico, and Cuba. The movements of salsa have origins in Cuban Son, Cha-cha-cha, Mambo and other dance forms, and the dance, along with the salsa music, originated in the mid-1970s in New York. The name salsa (mixture) has been described as a dance since the mid-1970s. The use of the term for the dance started in New York. It evolved from earlier Cuban dance forms such as Son, Son Montuno, Cha cha cha and Mambo which were popular in the Caribbean, Latin America and the Latino communities in New York since the 1940s. Salsa, like most music genres has gone through a lot of variation through the years and incorporated elements of Afro-Cuban and Afro-Caribbean dances such as Guaguanco and Pachanga. Different countries of the Caribbean and Latin America have distinct salsa styles of their own, such as Cuban, Colombian, Puerto Rican, L.A. and New York styles. There is some controversy surrounding the origins of the word salsa. Some claim that it was based on a cry shouted by musicians while they were playing their music. Others believe that the term was created by record labels to better market their music, who chose the word “salsa” because of its spicy and hot connotations. Still others believe the term came about because salsa dancing and music is a mixture of different styles, just like salsa or “sauce” in Latin American countries is a mixture of different ingredients. The arms are used by the “lead” dancer to communicate or signal the “follower,” either in “open” or “closed” position. The open position requires the two dancers to hold one or both hands, especially for moves that involve turns, putting arms behind the back, or moving around each other, to name a few examples. In the closed position, the leader puts the right hand on the follower’s back, while the follower puts the left hand on the leader’s shoulder. In some styles of salsa, such as the New York style, the dancers remain mostly in front of one another (switching places), while in Latin American styles, such as Cuban style, the dancers circle around each other, sometimes in 3 points. This circular style is inspired by Cuban Son, specifically to the beat of Son Montuno in the 1920s. However, as it is a popular music, it is open to improvisation and thus it is continuously evolving. Modern salsa styles are associated and named to the original geographic areas that developed them. There are often devotees of each of these styles outside of their home territory. Characteristics that may identify a style include: timing, basic steps, foot patterns, body movement, turns and figures, attitude, dance influences and the way that partners hold each other. The point in a musical bar music where a slightly larger step is taken (the break step) and the direction the step moves can often be used to identify a style. In partnering, the lead can decide whether to perform in open, semi-closed or closed position. Dance moves or step variety strongly depend on the music (such as the rhythms played by the different instruments), setting, mood, and interpretation. Unlike salsa, bachata dance does not usually include many turn patterns. In the West, various dancers are known to copy moves and turn patterns from various couple dances, performing these combinations in the timing used in bachata dancing, thus creating a fusion dance. The authentic dance from the Dominican Republic in the Caribbean is a basic dance sequence in a full 8-count moving within a square. Dancers in the Western world much later made up a basic step going from side to side, and also copied dance elements from other couple dances of various origins, Latin and non Latin alike. The basic dance sequence consists of three steps and then a tap step or various forms of step syncopation (such as the “double step”). Some dancers in the west accompany the tap with an exaggerated “pop” of the hips. Bachata can be danced on the 1st beat of the musical phrase, with the tap on the 4th beat, but dancing on the 2nd, 3rd or 4th beat is also common. The tap is done on the opposite foot of the last step, while the next step is taken on the same foot as the tap. The dance direction changes after the tap or fourth step. The “first dance” of a married couple is a popular element at modern European and American wedding receptions or post-wedding celebrations. The newly married couple, as the guests of honor at a dance, open the dancing. The style of dance is a personal choice. Some couples opt for a rehearsed, choreographed dance, whereas sources like etiquette columnist Judith Martin feel that performing a choreographed duet for spectators is inappropriate. In the past, the couple did not dance the first dance alone. In her 1922 guide, Ettiquette, Emily Post recommended that newlyweds not join the dancing until after their guests had begun, and simply dance with one another first before moving on to other partners. This occurred while other guests continued dancing, and was not given particular attention or treated as a performance. In the current times, ballroom dance is not a skill that is common within society. Therefore, some modern couples either slow dance or learn a dance, whether it be a ballroom dance style or a choreographed dance routine. 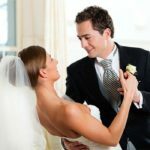 Teaching and rehearsing the “first dance” is now a service offered by dance studios, independent dance instructors and specialist wedding dance tuition companies.